This is me, plain and simple (thanks Dad, for your blue eyes and rosy cheeks! ), out for a walk on a snowy January/New Years day at the Country House. I can't believe it's already the 31st of January (and that I haven't yet blogged this year..bad me!) and I also can't get over how much fantastic "stuff" has already been packed into this year. This post is a photo journal of the comings and goings of 2016 so far....and what a fantastic time it has been! I had a furry friend with me on that snowy walk at the Country House! Charlie absolutely loves the snow...My almost 11 year old pooch turns back into a puppy whenever he's outside in the white stuff! It was then time to sit down (ok, or maybe lounge in bed) and set some plans into place for the year ahead. Whether it was personal or professional, I got out my Danielle LaPorte Planner, my notebooks and some sources of inspiration (The Happiness at Work Program - stay tuned for an upcoming post on this - and The Life Changing Magic of Tidying Up) and began to map out my 2016. There won't be any drastic changes, huge epiphanies or enormous lifestyle changes...but it always feels good to get thoughts out on paper and see how to guide myself into a year that I know will be filled with fun, great times and success! January has also been a month of 'sprucing things up' around the house a wee bit. Some new pieces of home decor, tidying up, organizing and really just continuing to make my City Cottage my home. And yes, as the sign says, feel free at anytime to get me drunk and ask me about New York...I have some great stories (keep an eye out for an upcoming post on NYC from my trip there in December). Life wouldn't be complete without gal time and what a fantastic gals weekend at The Rock again this year in Port Elgin (Thank you soooo much Carlie!!). As is always the case when you get a bunch of women together, there is plenty of yummy food, lots of laughs and many new memories made! We even made it to MacGregor Point to go skating through the woods and hiked along Lake Huron at sunset. Thank you to all the Donut Dolls for a fabtastic time! I've also been spending the odd Saturday at WillowHouse In Cambridge. If there was ever a store I would want to move into, it would be this one! Kim, the 'out of this world' owner of this beautiful shop, has such an amazing eye and sense of hitting every little detail just perfectly....Thank you for allowing me to become part of the 'family'! One thing I really do want to focus on in 2016 is trying new things and making memories! I've always loved the quote, "Fill your life with experiences, not things. Have stories to share, not stuff to show". I plan on doing this by pushing past my comfort zone and really living every moment possible. A friend and I decided to go out for dinner on Friday night to Manhattans here in Guelph to enjoy live music while dining on terrific food! It had been a very long time since I'd been to such a venue and it was SUCH a fun evening!! The band, the Eclectic Vinyl Orchestra was fantastic and uber entertaining and our dinner was scrumptious...Thanks so much Em for the wonderful suggestion! So cheers to 2016... I'm really looking forward to seeing what this year has to bring! It was time to decorate the sideboard for Fall (thanks so much to Ruralist for featuring my vignette!) and as I was looking through my decor pieces, I suddenly felt an urge to go orange! I have always gravitated to orange (my next pair of Hunter boots will be their burnt orange...I'm almost positive! ), but have been somewhat nervous to incorporate it into my home decor. Well, as you can see, I'm no longer nervous and love it! I also wish I had brought this colour into my home sooner. I was visiting my parent's a few weeks ago, picking up my pumpkins and gourds for my outdoor Fall decor from a farm a few roads over when I decided to stop in at The Garage in Belmore. I am soooooo glad I did! 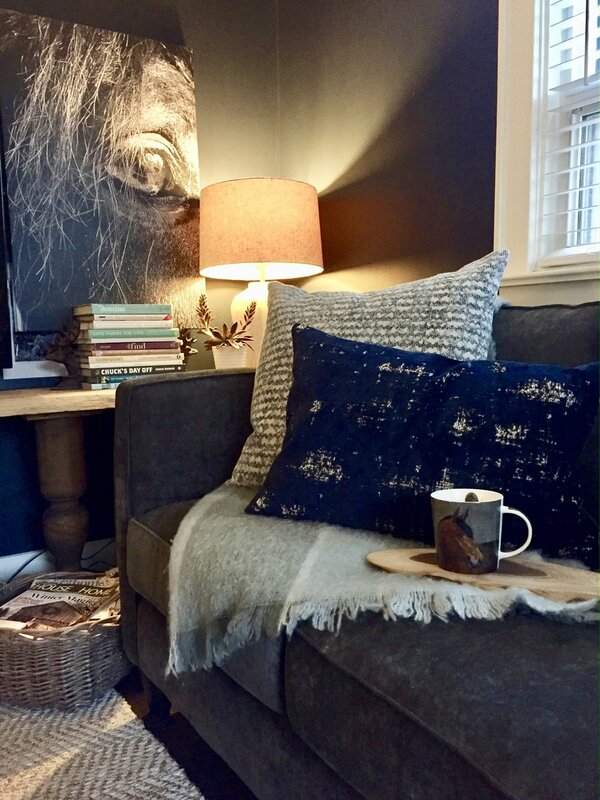 When I had started my Fall decorating inside my home, I felt something (or somethings) were missing, especially when it came to my sideboard (the focal point of my 800 square feet of living space). I was having this 'urge for orange' but didn't really have any pieces to fulfill that urge. The moment I stepped inside The Garage Home Decor, I spotted the orange urn and the birch picture and knew they would be coming home with me! As I wandered around the shop, I also noticed the orange and brown equine-esque infinity scarf, the deer print and the gold tea light holders. Literally every time I turned around, there was another piece I loved and wanted to bring home with me! I also picked up a few more items and was so happy when the total came to just under $200! Wow....less than $200 for pieces I can re-use again and again and don't necessarily only lend themselves to Fall. Upon returning to my parent's, I cut some grasses that would add some height to the vignette, but also some softness. I integrated the grasses, along with some mini pumpkins, corn and gourds from the farm, as natural elements to the display. I then raided my basement and other rooms in the house to pull the vignette together. I used feather wreaths from The Hive in Bayfield, a silver antler from Homesense and a glass cloche and coppery/bronze bowl from Achesons Pharmacy in Harriston. The wire and wood tray was a gift and I made the grapevine wreath from vine in my back yard. I'm so happy with how it all came together! And I'm SOOO happy I took a leap and brought orange into my home. I stopped into Achesons this weekend and there are some orange and grey plaid pillows that I was THIS close to taking home with me. I hope you all had a wonderful Thanksgiving Weekend and that you too 'take the plunge' and incorporate some colour into your Fall decor! Reinforcement = the process of encouraging or establishing a belief or pattern of behavior, especially by encouragement. A strong Mind, Body and Home needs Reinforcements......Whether it be a daily planner, a group of friends, an inspiring print or a favourite app, we MUST surround ourselves with who and what will encourage and assist us to be the best 'Me' possible. This is where Adaptability comes in...Adaptability AND Resiliency some days. There is one thing I can say about my life, and I'm sure yours too....as manageable as it is most days, when the curveballs get thrown, let's just say, they come in at 125mph and damn, there are some that come close to striking me out! Moleskines and a pen; so I can jot down ideas, lists, quotes etc as the day goes by...and so I can look back at all the good when it may not be quite as good a day as ones prior. Magazines; I subscribe to mags that let me lose myself in them, whose pages end up on my inspiration boards and that help keep me on track from a motivational standpoint. When I've had a rough day, I come home, pour a glass of wine and curl up with a magazine to either distract me for a bit, or to help me unwind. Fresh Flowers; I try and have fresh flowers in my home as often as I can, especially flowers from the Market here in town. They bring a smile to my face every time I look at them and really, I can't think of a better 'pick me up' then a bouquet of your favorites to bring some cheer and colour into your home. The Gym; I have two words for you: Leg Press! The days when the frustration levels are topping out are the days I actually have some of my best workouts! Head phones in, music turned up, water bottle filled...Bring on leg day..and heavy leg day at that! The great thing about working out is that it makes you so aware of the mind and body connection, especially when doing weights I find (I'm definitely a gal that lifts). You have little choice but to completely focus on your workout when you have a new personal best loaded up on the squat rack. Re-Organizing: one of THE best distractions for me is re-organizing, updating/refreshing my home decor and purging. It not only helps the mind de-clutter and settle to go through the creative process but it also brings a new sense of 'Me' to your/my space. It's a pretty great workout too if you're having to run things back and forth to the basement like I do. Cooking; there's something almost therapeutic about chopping up veggies, bbqing out in the sunshine and taking in all the yummy aromas as the meal comes together...maybe I was a sous chef in a prior life. Not only do you have the 'therapy' of the process, you know you have healthy, great food to feed your body too! Reinforcements.....we all need them and only you know what you need to ensure you remain successful, healthy and happy. I find as we get older, we hone in on what really works for us....What are some of your Reinforcements? Adaptability and Resiliency work hand in hand with your Reinforcements and the more tangible "tools" you have in your toolbox, the more emotionally strong, resilient and adaptable you should be able to be. I say should....but honestly, I really mean will. You WILL be more resilient and adaptable. I was having a lazy Sunday morning, lounging in bed and reading the newest issue of Style at Home mag, when Editor Erin McLaughlin's words leaped off the page at me! YOU DO NOT HAVE TO SPEND A FORTUNE TO CREATE THE HOME OF YOUR DREAMS!!!! Saving money is now 'trendy' ...I HATE that term (trendy)...but it's true! Even those celebrities and extremely successful business folk (who could afford anything and everything they could ever imagine) are making a point to show off how little they spend on items to decorate their home! I, on the other hand, have ALWAYS been proud of this! Don't get me wrong, I do splurge on items from time to time, but 95% of the time, if it is on sale, is a deal or a steal and I love it....I'm ALLLLL OVER IT! And in addition to being all over it, I enjoy sharing where and how to find these deals (like I will in this post). I'm sitting at my dining room table ($80) from the Hanover Market that I gave a 'face lift' to last year; on one of my dining room chairs ($10 - | paid $40 for the set of 4 at an auction and they will soon be getting a face lift); looking at my sideboard/buffet ($325 - and it also has a mirror that I use in a different room) from Craigslist and almost every object on top of the table or sideboard are deals I have found in shops across Southern Ontario (including the $7.50 tulips from the Guelph Farmers Market), or were gifts from amazing family/friends. Not too shabby for an entire room of furniture and decor items for well under $1000.00!! What I almost love more than the amazing deals is the fact that everything has been upcycled as they're quality, solid wood pieces that just needed a bit of freshening up (you can see why the chairs will soon be getting a face lift). You truly cannot find this type of quality furniture being made nowadays, unless you want to pay thousands of dollars for just one piece. I will have my sideboard forever! 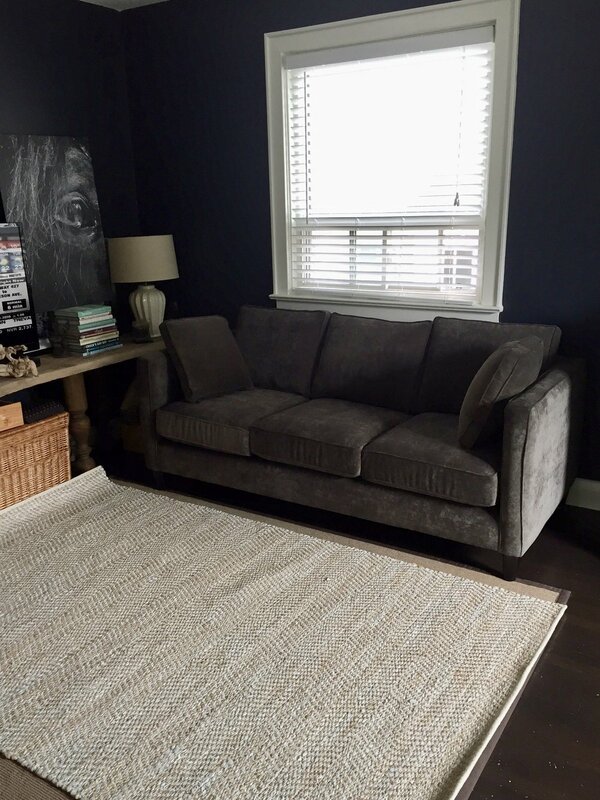 It is a classic and one of my favourite pieces in my home as it is THE perfect blank slate for so many design/decor options in the room! Then there's my living room. How do you like my coffee table ($10)? A friend spotted it at a yard sale and thought of me, so she bought it for me. I then brought it home, gave it a fresh coat of paint and, VOILA! 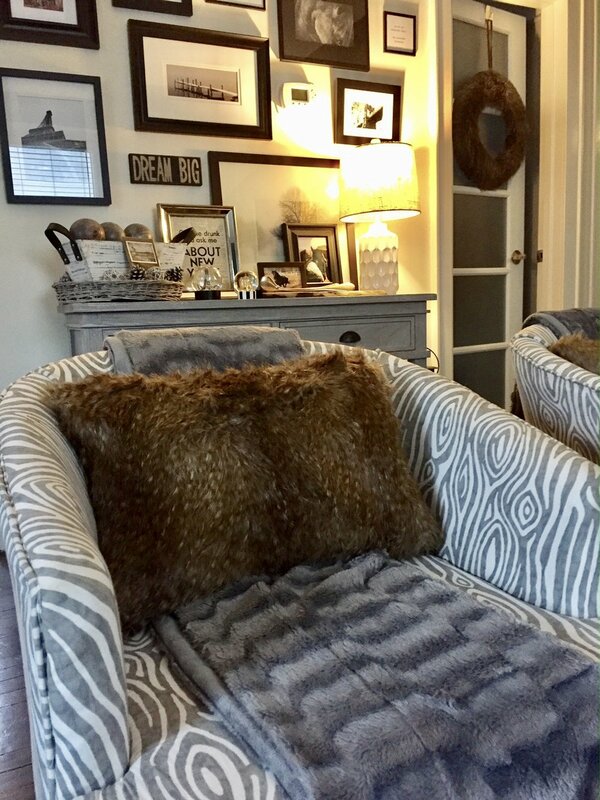 My club chairs ($20 each) were another Hanover Market find and after having them professionally re-upholstered with fabric from Tonic Living, they were still less than most chairs you would find in retail stores and the best part - they're custom!! My 'entertainment centre'.....After years of looking for a rustic and unique piece such as this, I finally found it in the small town of Neustadt at a shop called Refurbishment. It was WELL within budget (less than $275) and I LOVE IT!!! It was well worth taking the time to find it as I think it 'makes' the living room with it's raw edge and weathered appearance. This corner of my home has also been years in the making....I have had some of the photos/art pieces on this console table ($125 - a clearance find at Home Outfitters) for over 12 years! Pieces like the apothocary jar ($7.00 at an annual clearance sale in a small town near my parents - I can't share ALL my secrets *wink*) are multi-functional and can be used in every season by placing season-specific items within it. The little black leather stool ($5) was an auction find (I got 2) and the silver tray on top ($2) was from another cute little shop in Neustadt. The white deer ($15) and the 'Family' pieces (between $8-$20) are from The Garage in Belmore. This is my bed side table and....drum roll please.....it was FREE!! My Dad and I made it (which makes it even more special) from barn board from our old house (the one we lost in the fire) and a solid iron frame that was once used to hold a barrel of oil. It truly is a one of a kind piece and encompasses everything that making a house a home means to me! How do you make your house a home on a budget?? Buy/upcycle/make only what you absolutely love! You will be drawn to certain styles/items much more so than others. When you find 'your style' and you see a piece that fits into that style and that you LOVE, get it! Chances are, you will always find a way to incorporate it into your home for years to come! Don't be in a rush! Take your time and wait for those pieces that you love. It has taken me years of searching small town shops and boutiques to find just 'the perfect piece' and it was well worth it. If you're working with a budget, there's no sense buying something now for the sake of buying it, just to buy the same item in a year or 2 because you finally found what you're looking for. Buy multi-purpose pieces! The more versatile the piece, the more bang for your buck. The more you can rotate a piece through your home in different rooms and in all seasons, the more worthwhile is it to bring into your home! Shop locally and frequently! There's no better way to stay on budget than to become familiar with your local stores and boutiques, be-friend the owners, and shop there frequently! You will become familiar with their stock and what they tend to carry, they can add you to email lists regarding promos and sales and if you shop there regularly, you'll be the first to check out when items go on sale! Don't be afraid to DIY! Hop on Kijiji or Craigslist regularly too. When you see a piece you love, for a great deal, but it requires a bit of a face lift....go for it!! Purchase a test piece and try refinishing/re-painting it yourself. 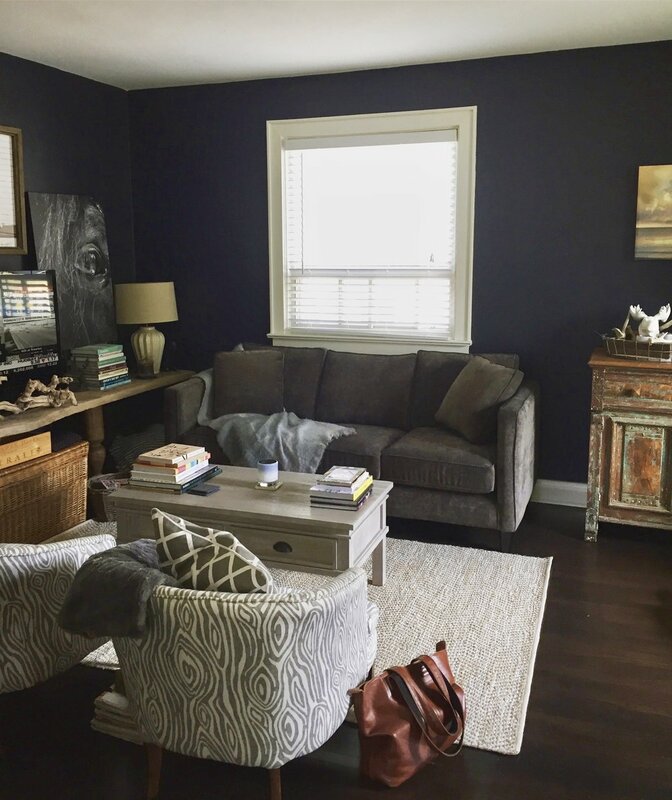 If you're not comfortable doing the refinishing, you can hire someone like myself to refresh your piece and even after paying for paint and the service, the piece will still likely be MUCH cheaper (and of better quality) than purchasing something brand new. These are just a few tips to help with the ongoing transformation of making the house you own or live in your own! If you would like more assistance with anything and everything related to your home, send me an email to rusticretrievals@gmail.com and we can work together on your project(s). I'm off to stock up on spray paint and make a visit to a local shop that has a piece I have been eyeing for some time now....Think I MAY just have to get it (it went on sale the other day)! !